Beijing Design Week with the collaboration of Dontstop architettura presents “Across Chinese Cities – Beijing” an unprecedented investigation into the Chinese capital’s spatial program woven into its ‘otherly modern’ project (Hay, Double Modernity, Para-Modernity, 2008) which situates its traces by taking the historical district of Dashilar as a case study. In making resonant the sedimental knowledge of archetypal and architectural past throughout the city from the early 1600s, the exhibition therefore looks at processes of continuous adaptation from times present and past which remain paradigmatic for many contemporary cities like Beijing. “Across Chinese Cities – Beijing” is a conversation between built forms and communities around an architecture of resilience and relationships unique to Beijing and the Dashilar area. The exhibition expounds upon Rem Koolhaas’ curatorial premise of an “Absorbing Modernity” by perusing the productive vacillation of policing directives and social forces that shaped the urban history of Beijing over centuries, and are here set in dialogue throughout two juxtaposed sections: “Across City Sections” and “Across Dashilar”. The spatial arrangement of the two components of the show elicit cross-references and counterpoints between the city’s macro transformations of a seemingly modernistic evolvement along 100 years, and the micro change-agents that traversed the history of Dashilar ever since its foundation as the ‘outer city’ during the Yuan Dynasty. 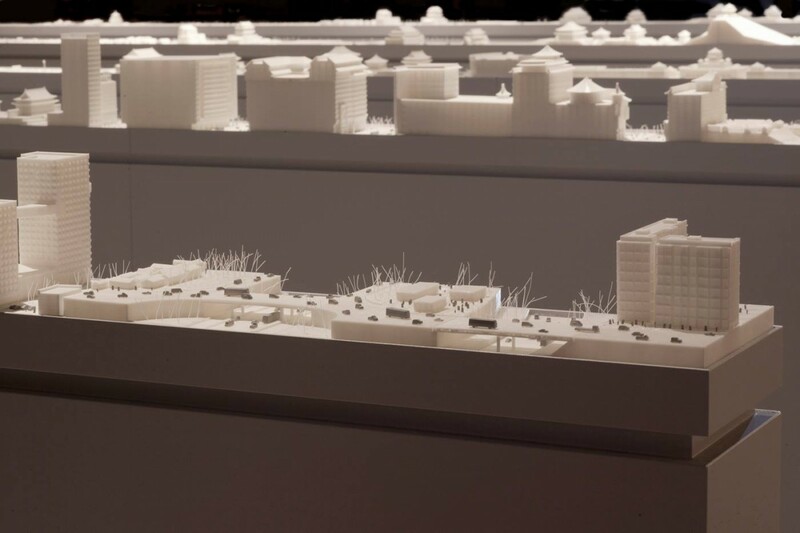 “Across City Sections” offers an overview of Beijing’s urban mutation in an installation consisting of a map of the city and a linear timeline marking five crucial moments during its history, realized as five 7m-long, 3D printed models scaled 1:500. From within these spatial and temporal sections, the invariant core of the Forbidden City and the grand transformations of the urban fabric are set in contrast with the small-scale changes of Dashilar, attesting to its adaptive capacity across different historical thresholds: 1488 – Foundation of Dashilar; 1914 – Construction of experimental Xiang Chang District; 1958 – Inauguration of Tian’anmen Square; 1992 – Opening of Henderson Centre, first Shopping Mall; 2014 – Beijing today. The dialogue between the overall exhibition and the central installation designs both a unified and synchronous glance at the city of Beijing, and underlines styles, practices and elements of resilience that cut across ages, while re-establishing an intimate relationship between the human body and the built environment. Countering the chronological linearity of this central portion of the show, “Across Dashilar” draws a circular and explorative path complementing an historical excursus along four key temporal crossroads – the Yuan Dynasty, the Ming and Qing eras, the economic reforms of the 1980-90s, and the XXI century – with an anthropological journey into its history as a space of autonomous alterity. Located southwest of Tian’anmen square, Dashilar is a densely populated quarter of traditional courtyards and alleys (hutongs) where behavioral and spatial hierarchies were often subverted. Here specialized craftsmanship and performing arts once flourished so making it the commercial and cultural heart of the capital since the Ming Dynasty. Through seven thematic frameworks “Across Dashilar” renders the entanglement of socio-cultural dynamics, economic ecologies and political factors that shaped the unruly architectural and social features which have long remained untouched by tested methods of urban revitalization. Unique photographic material and historical documentation assembled with the collaboration of Beijing based Sans Practice, is here presented for the first time in graphic frescos tracing the evolvement of Dashilar from external settlement of the imperial city to endangered historic district of the global metropolis. A series of case studies on building typologies, traditional industries, entertainment outlets like theatres and tea houses, as well as policy shifts around preservation and property rights, contextualize the more than 20 contemporary projects interpolated all throughout. As a result of the three year cooperation between Beijing Design Week and Dashilar Platform with the support of Xicheng District government, part of these interdisciplinary works were realised by a wide range of studios and creatives in response to the area’s infrastructural and communal ecosystem as part of a regeneration scheme based on a ‘nodal approach’ of mixed urban curation and community participation. So-dubbed Dashilar Pilots proposals by reMIX Architecture, People’s Architecture Office and Matali Crasset activate solutions for dynamic renovation, adaptive reuse and soft intervention of existing sites in the area, as does Zhang Ke’s ‘Micro Hutong’ project, which, already in existence, interacts with the hyper-dense context of the hutongs as a communal space for the inhabitants. These are further accompanied by a selection of works on various media ranging from photography (local resident Jia Yong’s 30 year-long survey of hutong goers), sound art, video (CYJO’s still and moving portraits of resilience of both the human and built environment; Varvara Shavrova’s voyage into the border-bending performances in Beijing Opera), animation (Instant Hutong’s especially commissioned short film ‘Blinking City’ on the ephemerality of hutong maps and topographical accuracy) and interactive applications (Meta-Hutong’s process-based investigation of the hutongs as a laboratory for knowledge production), to co-design (People’s Architecture Foundation’s situational workshops with kids and schools from the neighbourhood) and collaborative projects with local residents and craftsmen (students from the School of Design of CAFA as well as Lava Design Agency both embarked on experiments in social innovation with local business owners), are among other. Furthermore a related film program includes documentaries and the special screening ‘Beijing on Film – 1980s – 1990s’ curated by Xie Meng, which examines how the city of Beijing, its landscapes, and its residents, are depicted in five narrative films from the 1980s through the turn of the century. Tenement courtyards, public bathhouses, temple fairs, honeycomb briquettes, winter-preserved Chinese cabbages, pigeon houses… these films subtly capture essential elements of Beijing that are gradually disappearing from public life and memory. The exhibition design has been conceived by Dontstop architettura and Omri Revesz studio, and adapts the two scales tackled by the research project. In “Across City Sections” the visitor is invited to walk in between large three-dimensional models of the city, as if “urban canyons”, while in “Across Dashilar” a steel wire-frame structure mirrors the 1:1 scale relationships of the street, a paradigmatic condition of the historical neighbourhood. Ensuing from a collaboration with Venice municipality, Beijing Design Week’s participation to La Biennale di Venezia 2014 will be a first step in a three-year long program of cultural collaboration and exchange between the two cities. Official Sponsor: Shanghai Zendai Group, Sunshine 100 China Holdings ltd.